January Favourites | Becky Alyssa's Beauty Box. *insert I-can’t-believe-the-first-month-of-2015-is-over ramble*..hope you’ve had a brilliant month! Mine has been quite fun and busy, but stressful too! Not to mention very cold even on the South Coast – can warm weather come asap, please?! Here are some of my favourites that have got me through the most dreary, chilly month of the year! 1. Superfacialist Rose Brighten & Refine Facial Scrub (£8.99 via Boots) – Anyone else with ultra sensitive skin will already know the eternal struggle of trying to find an exfoliator that actually works but without leaving your poor face red and raw! I was told that rubbing with a flannel would be enough, but it’s really not effective enough. I’d tried numerous other scrubs but they were either much too abrasive, or the formula irritated my skin. I picked this one up on a whim so didn’t research it before buying as I’d normally do, but I am so glad I did! Using a tiny amount (squeeze around half an inch onto your fingers) and very gently rub all over, it does feel very scratchy and ‘I’m-totally-going-to-have-lobster-skin-after-this’, but somehow skin looks perfectly calm, as well as feeling thoroughly buffed and more radiant. I believe it might be the rose water in this that helps to calm – not sure, but it definitely works! I use every other day to keep my skin looking smooth and clear, with a clay mask once a week. 2. Lush Kitchen ‘Yummy Yummy Yummy’ Shower Gel (currently unavailable) – It’s a sad time – I discovered the brilliance of the Lush Kitchen this month! For anyone who hasn’t yet had the pleasure, every week Lush cook up very limited batches of favourite discontinued products down the road from me upstairs from their Poole store (yet I still have to pay the £4 postage!). This leads to a whole lot of refreshing the page at 8-9am when there’s something specific I’m after! Anyway, I didn’t manage to grab a Yummy Yummy Yummy shower gel when they were available, but was able to buy from a lovely seller via Instagram. And I’m so glad I did! It’s a real love-it-or-hate-it kind of product, with the scent of real fresh strawberries (no synthetic fragrances here) and added oils including almond oil to moisturise the skin. The scent does linger, which I love because it smells divine! Truly worthy of the name – I’ve been using this in the shower every single day. 3. 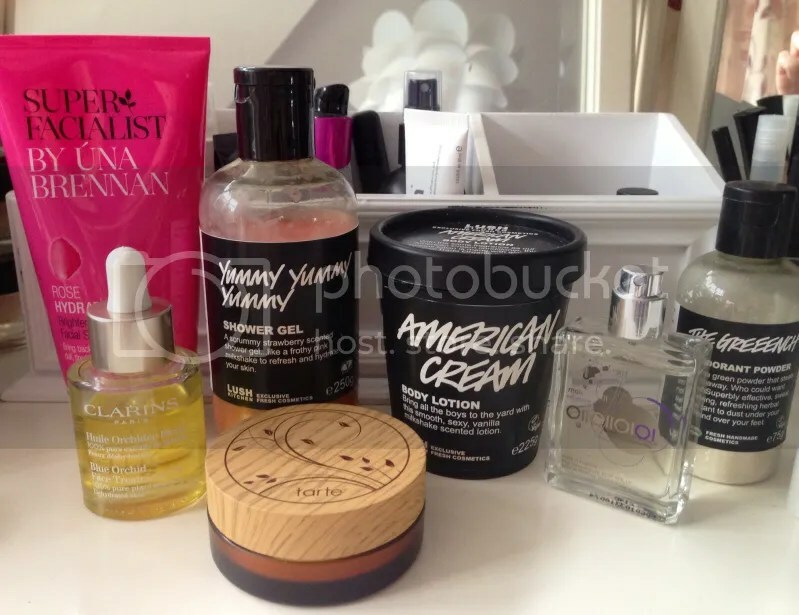 Lush Kitchen ‘American Cream’ Body Lotion (currently unavailable) – Another Lush Kitchen favourite, who would have guessed?! And again, I totally missed out first time round but managed to grab one on Ebay. And, like any brilliant limited edition product, I’m devastated this isn’t permanent! It just smells amazing – the exact same scent as the much-loved hair conditioner of the same name, a distinctive & unique vanilla, sage and strawberry. Delicious! I wish I had enough to smother myself in this every single day, it’s one of my all-time favourite Lush scents. 4. Escentric Molecules Molecule 01 (from £27 via Cult Beauty) – One of those products I’d heard raves about for months, but as there doesn’t seem to be anywhere to check it out in person, I felt very much in the dark about this! So many bloggers and vloggers claimed this as a must-have, yet not explaining why it was so good! As a self-confessed fragrance addict, I felt compelled to grab one and check it out for myself. For science, you know. Okay, so it is rumoured to smell unique on everyone, working with the natural warmth and chemicals of your skin rather than just a typical perfume scent. And that it acts somewhat like pheromones to make you irresistible to potential mates..who knows! To me, it is such a gorgeous woody-floral, slightly masculine scent – not far away from the likes of MAC Turquatic or Abercrombie & Fitch’s ‘Fiernce’. Yet it is very light and far from overpowering, making it very wearable for any occasion – it fades through the day and you don’t smell it yourself, but still very much sticks around for others to pick up. And the ‘attraction’ claim?! A great marketing ploy, perhaps! Although I did wear it on a date the other day (!) which I think did go well, if I say so myself! And I struggle with non-verbal communication, but I’m pretty sure a sales assistant was flirting with me when I wore this. Or maybe it’s just me! This is my current go-to due to its gorgeous, light, wearable and compliment-inducing scent. Fragrances are so subjective and the reviews are decidedly ‘meh’, but I would approve this as a must-try for everyone! 5. Lush ‘The Greeench’ Deodorant Powder (£6.25 via Lush) – Oh winter weather, how much I dislike you! Wearing layers and long sleeves 24/7 to insulate against the icy weather means my skin can’t breathe as much as it needs to. Inevitably leading to sore underams from my regular roll-on deodorant and sweating (not the most fabulous topic but we all do it). Sore, irritated underarms are so common around this time of year since we haven’t had warm weather and sunshine in months. I solve this painful issue by applying coconut oil twice a day, with a generous dusting of this powder deodorant on top to absorb excess moisture and neutralise odours. Featuring tea tree, thyme and sage, this does smell very medicinal and straight out of the garden, yet the smell doesn’t linger on your body unless you sniff directly under your arms, so won’t interfere with your perfume. I need something more powerful in the summer, but this is a perfect all-natural choice to wear under your long sleeves in the winter weather to keep your skin happy, chemical-free and smelling good. 6. Clarins Blue Orchid Face Treatment (£28.15 via Escentual) – I was initially very hesitant to purchase this in December as yet another cost amongst the present-buying frenzy of Christmas. But I’m very glad I did! Sure, applying oil to oily skin might be counter-intuitive, but this is an absolute saviour for dehydrated skin in the colder weather. I was having problems with flakiness around my nose, and yet my skin was still oily. Applying 5-6 drops every evening under my night cream, I started noticing improvements in my skin texture and less excess oil after only a few days, and 2 weeks later my skin looks and feels much more even and smooth. No breakouts or reactions to my sensitive skin at all. This has made a huge difference to my dehydrated, combination skin in the harsh, cold weather and I can’t recommend it enough! 7. Tarte Amazonian Clay Full Coverage Airbrush Foundation ($36 via Sephora) – I’d picked this up in Sephora in the USA a few months ago but only got around to trying it recently! First off, I’m not typically a powder foundation person – they barely seem to show up and I really need a liquid or cream formula to cover my redness. I’m NW20 in MAC and picked up the shade Fair Honey – although labelled as for ‘peach undertones’ this shade suits me just fine. There is a specific Tarte powder brush linked on the Sephora page which the product is advised to be used with, though my regular Bobbi Brown kabuki works fine. The packaging is pretty unique – a wooden bamboo style lid with a pretty decorative design. And interestingly, rather than a traditional plastic sifter, the inner ‘mesh’ is fabric and so stretches a little when the brush is used to allow the loose powder to be dispensed without mess. A loose powder you can travel with! I have to disagree with this being full coverage, more of a light coverage which is buildable to medium, but for more relaxed and lazy days where I still want some cover, this is a perfect mess-free, fuss-free and lightweight option, like you’re not wearing makeup at all. If I’m heading out to the supermarket or on a quick errand, I buff this all over my face for lightning-quick coverage with no cleanup required. A shame Tarte is only sold on QVC in the UK (and more expensive) as I’d recommend checking this out in person! I hope you enjoyed checking out my Favourites this month! Do you use & love any of these products? Link your latest Favourites post below & I’ll be sure to have a read!